This has implications for wind energy generation among other things. The results suggest that wind could be a more important source of energy generation than previously thought, with stronger winds across the UK. The research team concludes there could be a 10% increase in UK onshore wind energy generation, which would be sufficient to power the equivalent of an extra 700,000 homes every year based on current installed capacity. The results are relevant for decisions about future investment in onshore wind farms. To evaluate potential changes in European wind power generation in a 1.5 degrees C warmer world, researchers from British Antarctic Survey, the University of Oxford and the University of Bristol combined data from 282 onshore wind turbines collected over 11 years with climate model data from the HAPPI project. This study did not consider offshore wind energy generation potential. Across northern Europe, the results suggest that large areas of Germany, Poland and Lithuania could become more viable for wind power in future. But the biggest increases in wind could be seen in the UK—along with marked seasonal shifts in wind. "In future, nine months of the year could see UK wind turbines generating electricity at levels currently only seen in winter. 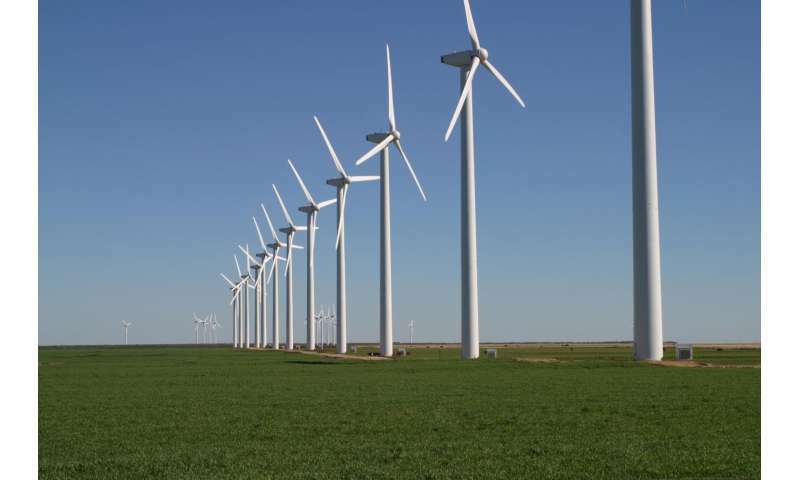 Future summers could see the largest increase in wind generation. Therefore, wind could provide a greater proportion of the UK's energy mix than has been previously assumed." Wind power is central to a low carbon economy. In Europe, wind energy currently accounts for 18% of total generating capacity and the European Commission's 2030 energy strategy set a renewables target of at least 27%. However, wind is also a highly variable energy source. While weather forecasts can help even out short-term differences in supply and demand, governments and industry need more information on longer-term changes in wind. Signatories of the Paris Agreement have committed to keep global average temperatures to well below 2 degrees C increase from pre-industrial times, with an ambition to limit the increase to 1.5 degrees C.
"New offshore wind turbines in Germany could "lead to the extinction of individual species" including the rare, intelligent, and highly-threatened harbor porpoise, according to Friends of the Earth-Germany (BUND)." "Migratory bat populations, including the hoary bat, could could go extinct, say scientists..."
"water, sunlight, and wind are so energy dilute, renewable technologies require orders of magnitude more land and materials to produce the same amount of energy as nonrenewables."